Hopkinton (Start to 2 miles): The race begins here, but if you think you&apos;ll find a good viewing spot, forget it -- it will be packed. Instead, meander down the route as far as a mile; around Frankland Road, you&apos;ll get a good view of the racers as they zip downhill from the starting line. Ashland (2 to 5 miles): The area around Ashland State Park is usually roomier than the center of town. Framingham (5 to 8 miles): Check out broad Waverly Street near the railroad station, about the 6-mile mark. The crowd thins out from Union Avenue to the Natick line. Natick (8 to 11.5 miles): The town green is likely to be pretty cramped, but if you get there early, you can snag a good spot. The 10-mile mark is at Central Street. Wellesley (11.5 to 16 miles): This town&apos;s business district features the exact midway point of the 26.2-mile race. But before the racers get there, the screaming Wellesley College students make for a lively -- and loud -- watching spot. It&apos;s also here that the racers leave Route 135 and merge onto Route 16. Set up either just before the college crowd or after, closer to Town Hall. Hunnewell Park is on a hill and provides a nifty overall view. Wide, straight Washington Street in Wellesley Hills is a great place, too. Newton Lower Falls, West Newton (16 to 17.5 miles): The well-known red brick Newton Fire Station marks the sharp right the racers must take as they turn from Route 16 (Washington Street) onto Commonwealth Avenue (Route 30) and face the daunting Newton hills. Lots of locals set up picnics here, but there should be room for newbies. Newton (17.5 to 20 miles): Lots of green space all along Comm. Ave. Check out both the Dartmouth Street and Chestnut Street intersections, as well as the lawn in front of Newton City Hall. Chestnut Hill (20 to 21.5 miles): This is the make-or-break section of the race: infamous Heartbreak Hill. You&apos;ll encounter another noisy college crowd here -- that of Boston College, right at the top of the hill -- but there are wide roads and green space for good viewing spots. 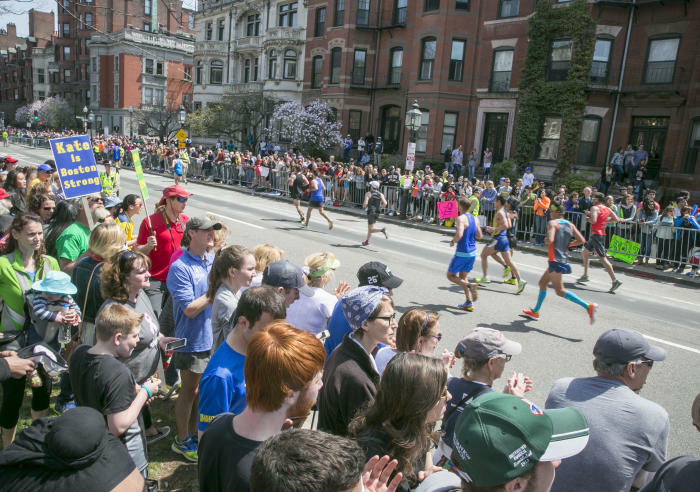 Brighton (21.5 to 22.5 miles): Another exciting spot to watch is Cleveland Circle, where runners turn left onto Beacon Street. The race is entering urban territory, with the attendant noisy crowds. Brookline (22.5 to 24.5 miles): The same can be said for lively Coolidge Corner. For a better view, walk down Beacon toward Kenmore Square until the crowd thins out a bit. Boston (24.5 to 26.2 miles): If you want rowdy, park yourself in Kenmore Square and bring a ladder (only kidding). The crowd swells when the Red Sox game gets out, and whether the Sox won or lost, they&apos;ll be um, very loud. This is the last wide-open space for viewing; from here, the racers continue down Comm. Ave., take a right onto tiny Hereford, then a left into the madness of Boylston Street and the finish line. Start Main St. Hopkinton 9:17 a.m. 9:17 a.m. 9:32 a.m. 10:00 a.m.
5K Rt. 135, Ashland 9:26 a.m. 9:26 a.m. 9:49 a.m. 10:15 a.m.
10K Rt. 135, Framingham 9:36 a.m. 9:38 a.m. 10:06 a.m. 10:30 a.m.
15K Rt. 135, Natick 9:47 a.m. 9:50 a.m. 10:22 a.m. 10:46 a.m.
20K Rt. 135, Wellesley 9:57 a.m. 10:02 a.m. 10:39 a.m. 11:01 a.m.
Half Rt. 135, Wellesley 9:59 a.m. 10:04 a.m. 10:42 a.m. 11:04 a.m.
25K Rt. 16, Wellesley 10:07 a.m. 10:14 a.m. 10:57 a.m. 11:16 a.m.
30K Rt. 30, Newton 10:17 a.m. 10:26 a.m. 11:14 a.m. 11:31 a.m.
35K Rt. 30, Boston 10:27 a.m. 10:38 a.m. 11:31 a.m. 11:47 a.m.
40K Beacon St., Boston 10:36 a.m. 10:49 a.m. 11:48 a.m. 12:02 p.m. FINISH Boylston St., Boston 10:41 a.m. 10:55 a.m. 11:56 a.m. 12:08 p.m.